White House counselor Kellyanne Conway participates in an interview with CNN at the White House in May. Conway was reprimanded for mixing partisan politics with her official duties in TV interviews last fall. OSC is an independent federal ethics agency that has no relationship with Department of Justice special counsel Robert Mueller's investigation into Russian interference with the 2016 election. 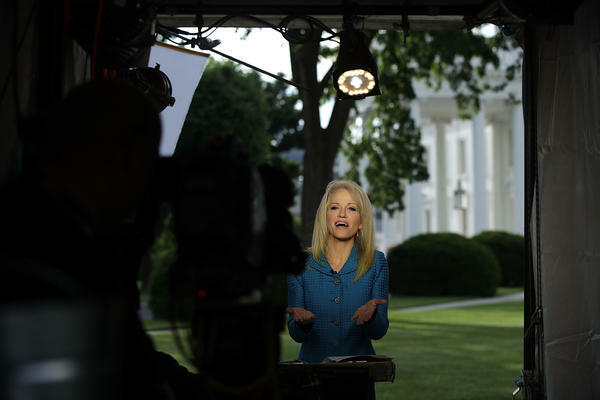 In two interviews on the Alabama race, one with Fox News and one with CNN, Conway spoke in front of the White House using her official title, counselor to the president, while repeatedly attacking the Democratic candidate, Doug Jones. "Doug Jones in Alabama, folks, don't be fooled. He will be a vote against tax cuts. He is weak on crime. Weak on borders. He's strong on raising your taxes. He is terrible for property owners," said Conway in a Nov. 20 appearance on Fox & Friends. Jones won the election and now represents Alabama in the Senate. "She simply expressed the President's obvious position that he has people in the House and Senate who support his agenda," said deputy press secretary Hogan Gridley, in a statement. "In fact, Kellyanne's statements actually show her intention and desire to comply with the Hatch Act – as she twice declined to respond to the host's specific invitation to encourage Alabamans to vote for the Republican." U.N. Ambassador Nikki Haley was reprimanded by OSC last year for retweeting Trump's endorsement of a South Carolina congressional candidate from her personal account. White House social media director Dan Scavino was also reprimanded for using a White House Twitter account to call for the ouster of a Republican member of Congress. Conway also came under scrutiny for endorsing the fashion line of the president's daughter Ivanka Trump during a February 2017 interview. Walter Shaub, the then-head of the Office of Government Ethics, criticized the president's decision at that time not to discipline Conway. Shaub, who has since left the government and now works for the nonpartisan Campaign Legal Center, said Tuesday that Trump needs to act on the OSC report about Conway. "The White House cannot continue to have one standard for the federal workforce generally and a lower standard for appointees who are close to this President."